Below is an essay on "Ap Fromat" from Anti Essays, your source for research papers, essays, and term paper examples. APA is an abbreviation for American Psychological Association. The APA has established formatting for use in written work within the social sciences. This formatting includes citations within the written work and to the references and endnotes/footnotes. Double spacing and typed (not handwritten) work is necessary. All work should be submitted on 8.5 x 11 paper. 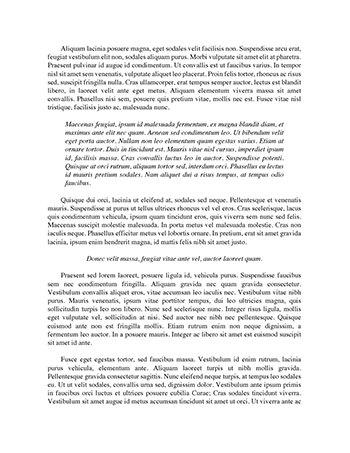 Page headers, with numbers flush to the right, should run on each page of the essay and include a brief version of the essay’s title in less than 50 words. Font should be very clear - 12 pt. Times New Roman is recommended. Essays must include four sections: References, Abstract, Body and a Title Page. On the Title Page include a centered (both horizontally and vertically) Title. The author’s name should appear underneath the title. Underneath the author’s name should be the institution with which the author is affiliated. Between 150 - 250 words, the Abstract should be the second page of the essay. The Abstract should be titled with the centered word “Abstract” at the top of the page. The Abstract should include major information from the research such as topic, question, methodology, analysis, participants and an overall analysis. Graves, M., Juel, C., Graves, B., Dewitz, P. (2011). Teaching reading in the 21st century, motivating all learners. Boston, Massachusetts: Allyn & Bacon.